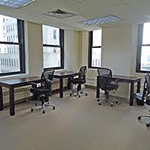 New York Offices can provide your business with Offices in the Chelsea neigborhood of Manhattan. You have three options in your hunt for office space; utilize a broker, search a database, or browse commercial real estate listings in NYC. Chelsea as they say has it all from a vibrant nightlife scene to fabulous art & shopping throughout. 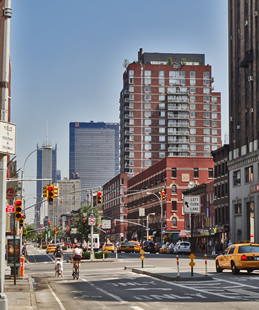 The neigborhood has also become synonymous with resident tech industry leaders such as Google and IAC / InterActiveCorp. But its not just Tech giants but also industry start-ups are also flocking to the area looking to capitalize on the Silicon Allley phenomenon. The neighborhood has also attracted artists, designers, and venture capitalists by the dozen each with a desire for the lofts / loft-like spaces which predominate Chelsea real estate. Much of what attracts companies to the area are the commercial lofts, which commonly feature high-ceilings, large windows, and either wood floor or concrete floors - the later of which may be load bearing which can be critical to any business with heavy equipment requirements. The typical commercial space in Chelsea commmonly enjoy all the amenities of a Midtown building but without the Midtown prices. Prices here are substantially lower than in Midtown Manhattan or other prime areas of the city. With space at a premium these days; larger tech companies are choosing Chelsea for its spawling floors which leads to better company productivity in the long run. If you are seeking a presence in Chelsea or just would like to know more before committing to a business move / strategy you can always give us a call at no obligation! We are happy to help you pursue and realize your real estate needs whether negiotiating a lease renewal or locating a new office space - we can help save you time & fustration! 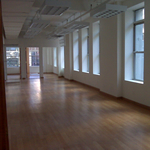 Chelsea Loft for Lease on 27th Street & 7th Avenue 2,100 SF. / $57 per SF. GOOD VALUE - This desirable loft office building is currently offering a number of creative space at affordable prices for the budget conscious business. This commercial loft is perfect for creative and technology companies seeking an open colaborative environment. The main strength herein lay in the generous open work space which is accentuated by 1-2 Private Offices and a Conference Room. Additionally this loft is classic both in form and function boasting 12 ft. beamed ceilings and 5 large south facing bay windows which help provide that open airy feel in the space. Futhermore, being that this is an open space loft it is then flexible in layout which can be made to suite most companies / needs. 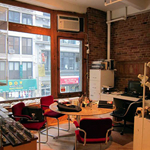 29th Street & 6th Avenue - Office for Lease 2,275 SF. / $55 SF. MANY WINDOWS - As you enter this newly renovated office loft, its hard not to notice the 60 feet of windows along one wall. This amount of light maybe well suited for thos with a need for natural "temperatured light" - such as imaging, graphics, architecture, photography and the like... In additon this loft enjoys unusually high ceilings and polished maple floors, when Combined with the available light - it almost takes your breath away! Join a growing tenant roster of media and technology firms in this very desirable Chelsea boutique loft style commercial building. 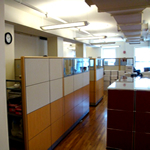 27th Street & 10th Avenue - Office Sublet for Lease 2,500 SF. / $50 SF. Next to the Starret Lehigh building there is a 2,500 SF. 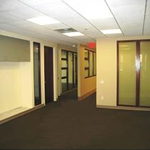 sublet office that has come up for lease now availble in the market. This space offers a tenant close proximity to the creative community and studio production found on the west side. Additionally the office situates your business right next to the Hudson Rail Yards - which are being developed at the moment (Hudson Yards is expected to consist of 16 skyscrapers containing more than 12,700,000 square feet (1,180,000 m2) of new office, residential, and retail space) and the Jacob Javitts Center. The property in which the office stands enjoys two dedicated freight elevators and two passenger - furthermore all the common areas have been renovated in the last 2 years. The direct leasing tenant + landlord are willing to modify this for accredited tenant.- as the sublet portion of the space is in a raw state - requiring the insight / direction of a tenant towards its completion. POLISHED - The following commercial space has been recently restored to its original glory. This classic pre-war office features 50 feet windows with a southern exposure - which will not send glaring rays of sunlight at the beginning or end of the workday. The space contains load-bearing floors which are of a polished concrete variety in addition to a dedicated frieght elevator - making for a great combination of features for those with heavy equipment or special needs. 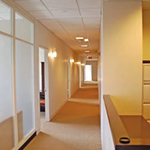 Beyond that the space comprises of 4 private offices, 2 conference rooms, a pantry, and 2 private restrooms. This office is "thusly" Move-in Ready able to acommodate a lease term from 3 to 10 years. Eighth Avenue Office for Lease 3,900 SF. / $55 SF. There is 3,900 SF. of available office space in a loft setting which is now seeking a tenant to lease. The loft herein consists of a full-floor plate with heavy load bearing floors currently in a white box state – white walls, concrete floors – all renovated and priced to move at $45 SF. The loft has an open configuration which allows for a flexible layout of your choosing all within a generous amount of space complimented by a set of six private offices, conference room and reception. The loft is serviced by its own pair of private restrooms with a capacity for 3 persons each. Furthermore the office is supplemented by a wet pantry with an area for seating and storage closet. The final caveat is the loft’s position in the building/block by which it sits – the space enjoys a corner allowing for tremendous light to flow in from 3 different exposures all from 20 windows. Eighth Avenue Office for Lease 5,000 SF. / $44 SF. 25th Street Office for Lease 5,000 SF. / $54 SF. The following space is located on the fourth floor of a beautifully restored commercial building. The office space available contains shiny, refinished hardwood floors throughout, a high beamed ceiling over an open layout which can accommodate many. In addition this space contains 2 new private restrooms, an exposed brick wall, a private outdoor space, tenant controlled HVAC, and security system. The utilities herein are billed directly to Con Edison. The building itself possesses a striking modern lobby, new elevator cab, and keycard access with intercom. 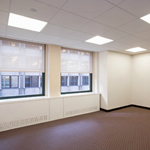 The building is 24/7 accessible and is very close to subways, cross-town buses, Union Square & Madison Square Park. This is a must see space and will not stay on the market long. Gorgeous loft in Chelsea with an unbeatable location. This open loft-style office has great natural light from the wall of street-facing windows and boasts new lighting, wood flooring, double glass entry, and tenant controlled AC (2012). This stunning space has a beautiful reception area, and is of a mostly open configuration with one built out office/conference room and professionally designed common areas. 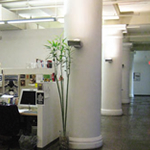 The building itself enjoys an impresive tenant roster and address, which is located close to the Union Square Suway hub as well as the Path Train at 14th street and Union Square Park. Broadway Office for Lease 5,800 SF. CALL FOR FURTHER DETAILS. Spacious Chelsea loft that spans an entire floor of a building which has charming white ceiling tiles and an elevator that opens up right to the floor. The loft/office fronted by a glass enclosed lobby, a private glass office/conference room, and a number of large windows that help create great natural light and from which offer high vantage views of the surrounding area. The floors are beautiful hardwood and the walls are freshly painted. 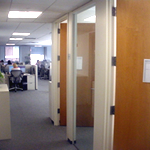 Futhermore the office contains its own pair of restrooms and a pantry with enough room for seating all of which is serviced by 5 closets of varying size. 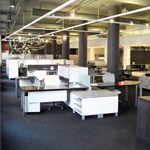 The office herein is located on one of the best blocks in the neighborhood, and is perfect as either a traditional office or as an expansive showroom. Neigborhood Details Noteworthy Properties: 75 Ninth Avenue (Chelsea Market), 76 Ninth Avenue (The Google Building aka Googleplex)IAC Building (550 West 18th Street), and The Starett-Lehigh Building (601 West 26th Street). Corporations Headquarters in the Area: Aeropostale, Apple, Armani Exchange, The Chelsea Brewing Company, Chelsea Garden Center, Club Monaco US, EMI Music Publishing / EMI ENtertainment World, The Food Network, Google Inc., IAC (InterActiveCorp), Hugo Boss, Martha Stewart Omnimedia, Mattel Inc., The Mcgarrybowen Advertising Agency, MLB.com, Moët Hennessy, Mr Youth, NY1 (Time Warner Entertainment), Opera America, Oxygen Media, and The Ralph Lauren Corporation (Tommy Hilfiger). Nearby Landmarks: Chelsea Piers, The Chelsea Market, Chelsea Studios, Church of the Holy Apostles, Empire Diner, The General Theological Seminary of the Episcopal Church, High Line Park, Hotel Chelsea, Hudson River Park, London Terrace, Penn South, Peter McManus Cafe, Pike's Opera House, and The Rubin Museum of Art. Hotels in the Area: The Chelsea Hotel, Chelsea Pines, GEM Hotel, Dream Downtown, Fairfiedl Inn & Suites, Four Points by Sheraton, Hampton Inn, Hilton, Holiday Inn, Hotel Indigo, SOHO House, and the Wyndham Garden.